"A Structure To Last Forever":The Players' League And The Brotherhood War of 1890" © 1995,1998, 2001 Ethan Lewis.. All Rights Reserved. In late June 1889, John M. Ward was faced with the biggest problem of his life. The talented shortstop of the New York Giants was playing typically stellar ball, and was on his way to the World's Championship that season. Off the field, however, the man who was also president of the Brotherhood of Professional Base Ball Players (a protective association which was the first union of professional athletes in the United States) had to deal with a crisis unprecedented in American sports. Faced with a new plan meant to severely limit their salaries, the members of the Brotherhood--virtually every player in the National League--were preparing to go on strike on July 4th. How John Ward dealt with this situation, and the results of his solution, make up the basis for this paper. Abolition of the classification system and reimbursement for all losses incurred by players. No reservation for a salary lower than that of the previous year. The Players' National League of 1890 represented the final significant challenge to professional sports as we know them. The Players' League was a case of skilled laborers attempting to regain control over the sale of their product (baseball games) from the profit driven entrepreneurs who controlled the established major leagues. The Players' League was a conservative revolution, which looked back to the earliest days of professional baseball as an organizational model which enabled players to have more rights and options than the established major leagues permitted. Contrary to most historians' treatment, the Players' League was not doomed from the start; in fact, it was a highly viable product which ultimately fell apart due to naivete, and the victory of profit over principle on the part of some of its members. While the Players' League only existed for the season of 1890, it is historically significant as it marked the final (and only) challenge to the organizational structure of professional sports. Major League Baseball, as the earliest organized professional sport, has been the model for all other sports leagues in the twentieth century.7 In brief, the sports leagues are cartels, whose members compete on the field but collude to varying degrees off the field in order to ensure a competitive balance among their teams to guarantee continued attendance. One of the key characteristics of this organizational structure is that players are contracted employees, and have no ownership interest in the corporations (clubs) for whom they work. Also, players have no voice in league operations, and are subject to have the right to their labor traded or sold to other corporations (clubs) without the player's consent.8 The Players' League was the only attempt to create a rival league organized on a different basis. It was a co-operative, where players were investors in their clubs, player trades were by consent, and the "capitalists" (not owners) were to divide the profits equally with all the players. I propose an alternative view of these events: that the Players' League-- far from being doomed from birth-- very nearly succeeded in surviving the "baseball war of 1890", and had it been successful, it would have altered how professional sports are constituted for all time. It is apparent to this writer that in 1890 the Players' League possessed the best players, attracted more spectators, and had every intention of becoming the predominant major league in America. The story of the Players' League, the successes and the failures, can provide useful lessons for future alternative professional sports leagues, including perhaps the proposed United League, which is set to open in 1996, and intends to operate on a similar co-operative basis. 1. Big Strike Imminent", The Sporting News June 22, 1889. 2. The League Strike" The Sporting News June 29, 1889. 3. Harold Seymour, Baseball: The Early Years (New York :Oxford) 1960. p. 129. The levels were as follows: Class A=$2,500; Class B=$2,250; Class C= $2,000; Class D= $1,750; Class E= $1,500. Obviously, most players did not make the maximum within each class. According to the plan, if a player received more than his Classification salary, he was to be blacklisted, and his team was to be fined $2,000. "The League Meet" The Sporting News November 28, 1888. This was often honored in the breach, as many stars received total payments up to $6,000, but it was a strong threat, and did serve to hold down the salaries of most ball players. 4. John M.Ward, "The Players' National League", Players' National League Guide (Chicago: W.J.Jefferson) 1890. pp. 3-4. 5. Seymour, Baseball: The Early Years p. 121. 6. Ward, "The Players' National League" p. 4. Seymour, Baseball: The Early Years p. 227; Lee Lowenfish and Tony Lupien, The Imperfect Diamond : A History of Baseball's Labor Wars (New York: Da Capo) 1991. p. 34. 7. However, only baseball is exempt from the anti-trust laws of the United States, as a result of the Federal Baseball v. National League decision of the Supreme Court in 1922. 8. For a complete analysis of the organizational structure, see Gerald Scully, The Business of Major League Baseball (Chicago: University of Chicago) 1989. Also, Roger G. Noll, ed, Government and the Sports Business (Washington, D.C.: The Brookings Institution), 1974 is a good collection of analytical essays on this topic. 9. Seymour, Baseball: The Early Years . Seymour wrote: "The venture was unique in the American business world. Farmers' and workers' co-operatives were an old story in America, but the Players' League went them one better. It was a democratic alliance of workers and capitalists in which both were to participate in the government and share in the profits of the enterprise. It was a startling contradiction of traditional communist dogma that capitalists always formed a united front against workers. Here was a group of capitalists, associated with employees, preparing to wage a bitter fight against other capitalists!" p. 228. 10. David Q. Voigt, American Baseball: From Gentleman's Sport to the Commissioner System (Norman: University of Oklahoma) 1966. p. 156. Voigt presents Ward almost as a proto-Progressive, an upper class, privileged man who "felt a deep sense of mission for his fellow players, who in turn respected and trusted him." p. 156. As will become clear in this paper, I feel that this is a simplistic view of Ward and his motives, as well as of the Players' League phenomena itself. In 1995 word came that Voigt had a book forthcoming, entitled The League That Failed . The book has just been published in 1998 and it remains to be seen if he has added to his analysis in the last thirty years. [June 1, 1998]. The League That Failed is an interesting book, but it only tangentially mentions the Players' League and the Brotherhood. The "league" to which it refers is the "Big League"; the 12 team National League that lasted after the failure of the American Association until the coming of meaningful competition from the American League in 1901. [July 5, 2001]. 11. Lowenfish and Lupien The Imperfect Diamond . p. 51. 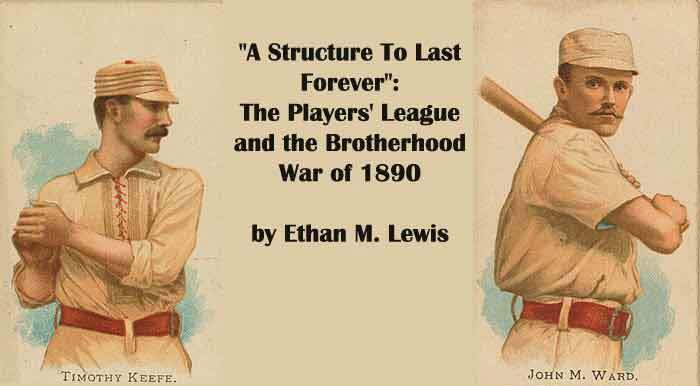 "A Structure To Last Forever":The Players' League And The Brotherhood War of 1890" © 1995,1998, 2001 Ethan Lewis. All Rights Reserved.